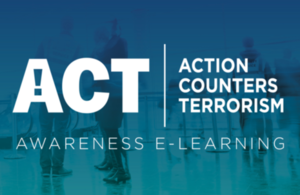 ACT Awareness eLearning will provide nationally recognised corporate CT guidance to help industry better understand, and mitigate against, current terrorist methodology. URL: You will be provided with your own corporate URL link and PIN to immediately access the online version. SCORM: If you intend to deliver the ACT Awareness eLearning course using your own learning management system (LMS) then we can supply a SCORM 1.2 compliant file. Can I share my password for the eLearning with other companies? Will the e-learning programme work on my devices? This online training solution will work on Windows or Apple desktop PCs or Laptop computers. It will also work on iPads running the current version if iOS and Android tablets from mainstream manufacturers. I am a Small to Medium Enterprise (SME) with a small workforce and no Learning Management System, which version will best suit me? In this scenario you should use the ‘URL’ based version which can be accessed from ct.highfieldelearning.com. Staff will receive a certificate on completion of all modules. Which version will allow me to track my employees’ completion of the eLearning? The SCORM version will allow you to track the progress of your employees. You will need your own Learning Management System (LMS) in order to do that. Learning Management Systems can be downloaded for free if you have technical staff able to configure them. Many LMS providers offer subscription services, these can used if you do not have the internal resource required to manage an internal LMS. How long will the URL last? Once you have been issued with a ‘URL’ account, this will remain active for the duration of the tool’s availability unless you choose to close your account or your account remains inactive for a 12 month period. NaCTSO may choose to remove or replace this service. How long will the SCORM last? How long does the e-learning take to complete? Can this e-learning be completed in groups? Yes. When you start the course you will be asked how many learners are present, please make a selection and deliver the course to your group. I have lost my original access e-mail, what should I do? Please contact nactso@met.police.uk who will be able to re-send your invitation. I have lost my PIN, what should I do? Please contact nactso@met.police.uk who will be able to re-send your PIN Code.